EA7 is back! Building over the encouraging game in Kaunas, it won as a team in Siena, with five players scoring in double figure, allowing only 66 points and didn’t have to rely on a specific player. After 18 consecutive losses in Siena, finally a win. Alessandro Gentile was the game top scorer, but everybody was useful and it’s worth mentioning a greayt game by Richard Hendrix, who scores, makes himself felt under the boards, has an impact. And in the closing minutes, Keith Langford makes two crucial field goals. FIRST HALF – It’s a great start the one from Bobby Brown. Siena’s point-guard scores 7 of the first Montepaschi’s nine points. Siena is up 9-5. EA7 plays team basketball offensively and responds with a 7-0 run capped by a Omar Cook three. The Cap defensively strips a couple of basketball from Brown. When Langford makes two from the line, Olimpia is up by five, 19-14, protecting the lead until the end of the first, thanks to a couple more made by Alessandro Gentile. The second period starts with two consecutive energy field goals by Hendrix. Banchi calls time-out when Olimpia goes up by 9, 25-16. EA7 holds Siena scoreless for 3:40 when brown makes two foul shots. But Cook makes a three, Melli a very long 2-pointer and in the middle of the second the lead blows up to 16 points, 34-18. Montepaschi responds because of Sanikidze energy: the Georgian dunks and blocks a Langford drive. Coach Scariolo calls time-out immediately and it’s a good move because Hairston stops the run with a big post-up basket (he actually missed but grabbed the board and scored) and Bourousis makes a huge three pushing EA7 up by 17, 39-22. At the intermission is 39-26. SECOND HALF – Viktor Sanikidze tries to lead Siena again, finishing a break and making a three. In the middle there’s another Cook three. Coach Scariolo calls time-out to stop the momentum when Olimpia is up 42-33. 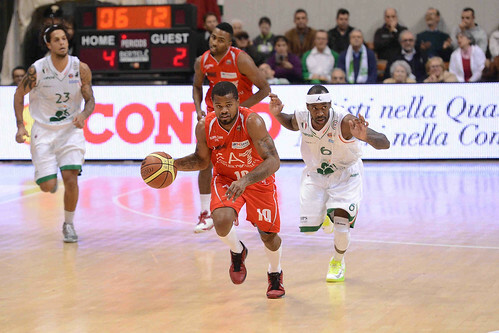 When Montepaschi is again within seven points, Richard Hendrix scores twice in a row, dominating the offensive board. Fotsis makes a three, 41-37. Siena is hanging on Brown scoring sprees. He has 21 at the end of the third but when Siena is within 10, Gentile makes a long 2-pointer and then converts a three-point play. 55-41 and 56-45 entering the fourth. Gentile leads Olimpia at the start of the fourt, forst with an offensive board converted in a basket then with a strong drive. That’s also the moment Siena is producing the best effort, getting back to 7-down, 53-60, after a Brown’s three-point play. Langford responds with a huge three, Siena keeps fighting, scores with Ress and Hackett and it’s within six. Fotsis re-enters for Melli and makes the 66-57 three. Langford scores on a big drive closed by a running left-handed hook shot. Hairston dunks and it’s 70-61 enetering the last two minutes. Siena makes a three with Kangurd, Hackett makes a couple of free throws (makes also a steal taking advantage of Cook slipping on the wet floor). The last minute is strange, because EA7 misses three free throws out of four but still controls the rebounds and win.